There's no need to hype this one up. Ireland's meeting with England at the Aviva Stadium is that rare and perfect thing: a contest between two indisputably excellent teams where there is an immense amount riding on the result in both the short and long terms. It may be the most significant meeting between the two countries since they met with the Six Nations, the Grand Slam and the Triple Crown all on the line at Lansdowne Road in 2003. Back then, England romped to a 42-6 victory, their eighth win in nine games against Ireland and one which showed that Clive Woodward's team were poised to crown a decade of dominance with a World Cup victory later in the year. 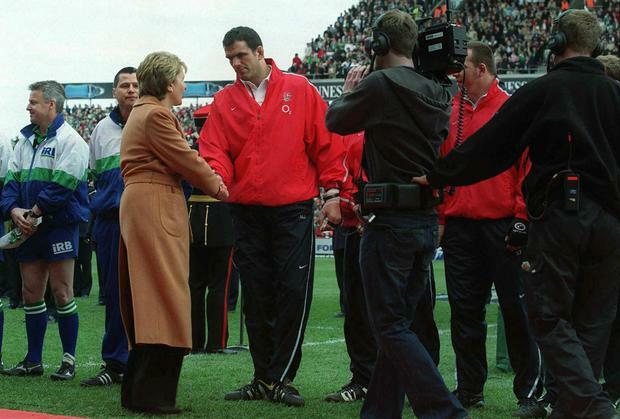 The Irish media consoled themselves by pretending that the real story of the day was Martin Johnson's refusal to move his team to suit Mary McAleese. The Irish management and players, on the other hand, saw how far they had to go and the golden spell which followed was to a large extent the story of how we rose to the challenge posed by England, winning seven of our next eight matches against them. But now the pendulum, despite Ireland's Six Nations victory last year, shows signs of swinging back and England will be seeking a fifth victory on the trot against the home side today. There have been times in the past when even the biggest Six Nations encounters could be dismissed as sideshows, pale and ersatz imitations of the real stuff being served up on the other side of the equator. Not any more. The All Blacks may still be the undisputed kings of the world game but the combined three wins out of four by Ireland and England against South Africa and Australia in the end-of-year internationals shows how the gap has been closed. Both of these teams are serious World Cup contenders. But that's getting ahead of ourselves. First there's the Six Nations to be decided and while there are a couple of banana skins remaining for both sides, our visit to Cardiff, their home clash with France, there seems little doubt that whoever prevails today will win the championship and could go on to clinch a Grand Slam. It's unlikely that either team will be able to do what Ireland did last year and go on to win the title despite losing this game. Because this season both countries seem to have moved clear of the chasing pack and to have improved significantly in doing so. The additional self-belief which flowed from the remarkable feat of clinching the championship with only a second victory over France in Paris in 42 years was obvious when Ireland outclassed South Africa and won an all-time classic against Australia before Christmas. And it's not long, only two years ago in fact, since England would have folded after the disastrous start which saw them trail 10-0 after just eight minutes against Wales in Cardiff. Their fightback and the complete dominance they enjoyed in the second half of that game confirmed the impression of progress given by their narrow defeat against the All Blacks and comprehensive victory over Australia. You have a feeling that, with a home World Cup coming up, the English rugby players like their athletes and cyclists in Olympic year are being driven to greater heights by the prospect of achieving ultimate glory on home soil. This is the biggest test either team will face before the World Cup and victory will be a proof that they need fear no opposition going into that tournament. The quality of opposition today is such that a victory simply can't be regarded as anything other than a major achievement. The English rugby media and supporters seem possessed by a sense of destiny at the moment and have been displaying levels of chariot-swinging confidence not seen since the heyday of the Woodward team. They would freely admit that this side is not the equal of that magnificent 2003 team but it may perhaps be a new version of the 1991 side which reached the World Cup final and kick-started the most successful period in the country's rugby history. Winning in the Aviva against a battle-hardened Ireland with a team where no-one has reached their 30th birthday and eight players who are 25 or under would confirm their suspicion that the future is English. It would be the kind of result England have not produced in the Six Nations for some time and would confirm this exciting young team as the real deal. There's just as much at stake for Ireland. Our last Six Nations triumph was predicted to be a launching pad for even greater things but instead it proved to be a trapdoor. Unlike England, France and Wales, who've regularly put back-to-back outright titles together over the years, Ireland have achieved the feat just once, in 1948 and 1949. A win today can end this boom-and-bust tendency and also set the England project back on its heels for a bit. Our media and fans have not been as bullish as their English counterparts this season but there is a suspicion that Ireland have a truly big performance up their sleeves and that it will be unfurled today. Hence, in a game almost too close to call, we will begin as the slightest of slight favourites. If the English youngsters who have looked so promising this year do not wilt under the pressure exerted by a fired-up Ireland, they really will be something special. England will remember the torment they inflicted on the Irish scrum in this fixture two years ago and expect Joe Marler and Dan Cole to hold a decided edge over Mike Ross and Jack McGrath. On the other hand, Paul O'Connell will surely fancy reprising his traditional role as scourge of the English lineout against a moderate second-row pair of George Kruis and Dave Attwood who owe their unlikely ascent to an injury plague which has cost Stewart Lancaster the services of Joe Launchbury, Courtney Lawes and Geoff Parling. The back-row clash between Peter O'Mahony and Seán O'Brien and Chris Robshaw and James Haskell will be worth the admission price on its own. Ireland will feel the loss of Jamie Heaslip in that area but England will rue the absence of Mike Brown, so influential last year at number 15. His replacement Alex Goode is not in the same class as a counter-attacker and looks certain to be tested early and often by Johnny Sexton's kicking. Ireland's fullback problem is of a different order: how to ensure the prodigious talents of Rob Kearney are more fully utilised. Ireland would seem to have the edge at half-back where both Sexton and Conor Murray are in the form of their lives. Ben Youngs hasn't quite fulfilled the extraordinary promise of a few years ago while immensely talented as George Ford is, today represents an enormous challenge for a 21-year-old outhalf. Then again England have Danny Cipriani in the wings, a player who could be either hero or villain depending on how the mood takes him. They also have the outstanding centre of the championship so far in Jonathan Joseph while we wait for Robbie Henshaw to burst from his chrysalis as he undoubtedly will before too long. There are a host of intriguing individual duels which, when combined, will decide the outcome of today's game and perhaps the direction of the Six Nations in the coming seasons. No-one will be winning this one by 36 points. And if Ireland lose there won't be much consolation in pointing out that Dylan Hartley obviously didn't appreciate Michael D's latest poem. You see, if England can beat this Irish team in our own den it will be an awful long time before they fear a trip to Dublin again. So now is the time to take the wheels off that bloody chariot, force it off the road and turn it into scrap. Ireland expects. It's going to be sheer torture waiting for 3 o'clock. But sheer bliss once that whistle blows. The dream is still alive. If Ireland's Cricket World Cup win over the West Indies was an exhibition of controlled excellence, the victory over the United Arab Emirates was a masterpiece in the art of getting things done. After the UAE's pair of Shaiman Anwar and Amjad Javed put together a tournament record seventh wicket partnership to give their side an imposing 278-9, it began to look as though Ireland were suffering that most accursed of sporting phenomena, 'The day when we just couldn't get going'. Man of the match first day out Paul Stirling exited the scene in quick order and while his fellow hero from Nelson Ed Joyce hung around a bit longer he never recaptured the fluency which had marked their batting against the West Indies. Fours were so conspicuous by their absence it was though the Gulf state team had thrown up a force field in front of the boundary. Gloomy sod that I am, it struck me that this was the inevitable follow-up to the first day's heroics. After the soccer team's World Cup victory over Italy came the loss to Mexico; after the Rugby World Cup victory over Australia, shock defeat by Wales was not far away. And now the shockers were about to become the shockees once more. Enter Gary Wilson and, most importantly, Kevin O'Brien. O'Brien is a great boon to people, like myself, who not having played the game of cricket may not be entirely conversant with the delicacies and intricacies of the batsman's art. As one of the commentators put it, he is not subtle. He just comes on and flakes the ball as hard as he can, like a man driving a post into the ground with a sledgehammer. By God, is it satisfying to look at. And with O'Brien wielding the big axe and Wilson chipping in alongside him, Ireland came back from the apparently dead, like Glenn Close rising out of the bath in Fatal Attraction. They looked to be on the way to victory when O'Brien hit two mighty sixes but then he was out next ball. Breathing space once more seemed to be attained after two successive fours by Wilson but he went straight away too and you realised we were going to have to suffer all the way for this one. It was like being on one of those cunningly designed rides at Funderland which just as you thought you'd regained a bit of equilibrium sent you dipping and plunging once more. The daredevil element was further emphasised by running between the wickets which reminded me of watching Evel Knievel jump his motorbike over a line of cars. You braced yourself for the impact which proved the enterprise's inherent foolhardiness but it didn't come. Ireland defied the Emirates to run them out and got away with it as the winning runs came from a couple of tail-ender slogs by George Dockrell. The feeling that this campaign is being scripted by an expert in the field of feel-good sports movies was confirmed. Two wins from the last four games will definitely bring Ireland to the quarter-finals, one might even be enough. I'd be inclined to think the outing against South Africa in Canberra on Tuesday morning can be written off but with this team who can predict anything? The Saturday morning showdown with Zimbabwe in Hobart is both a must- and a can-win and perhaps as important a match for Irish cricket as there's ever been. It would be great to see a really impressive émigré turnout for that one. They mightn't be our most powerful national team but right now the cricketers are hands down the most exciting to watch. The Sigerson and Fitzgibbon Cups are the Rag Weeks of Irish sport, venerable third-level traditions which don't get much love from the general population. There are other resemblances. While the competitions bring much joy to the youngsters involved, most county and club managers and fans, like the citizens of towns affected by Rag Week, just wish the thing was over and hope that not too much damage gets done in the meantime. And whereas, during Rag Week, a hardy few bring the concept into disrepute by terrifying OAPs, collapsing on the street in a pool of puke or ending up in casualty, in the Sigerson and Fitzgibbon Cups we have the unedifying sight of teams fighting over the eligibility or otherwise of players and games being delayed by dispute after dispute. The result in Rag Week is that it's not the money raised for charity which makes the headlines but the anti-social behaviour of a minority. And the result in this year's Sigerson and Fitzgibbon is that the competitions will be remembered for all the disqualifications, objections, counter-objections and reinstatements rather than, for example, what was apparently an excellent football final between DCU and UCC. Unfortunately, all this creates a perception in the public eye, so that when someone tells you that the Sigerson and the Fitzgibbon deserve the height of respect, they sound a bit like the guys who describe Donegal Tuesday as one of the great fun traditions in Irish life. And your reaction tends to be the same too. They're decent lads but it'll be great when they've grown out of this.